Because birds spend most of their time standing on their feet they need comfortable perches ... much the same as we prefer a comfortable pair of shoes. 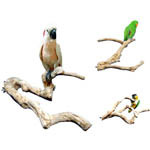 To meet the necessity of providing a bit of nature for your pet birds, we offer a variety of perches of natural wood. This selection includes perches made of Manzanita, Dragonwood, sandblasted Grapevine, Cholla (Cactus) Wood, Lima Tree wood, Cajeput (Paperbark Tree), Java Wood (Coffee Tree) and other hardwoods in various sizes and diameters. Please Note: The representative images of products made of natural materials (such as the natural wood perches on this page) are examples of the style and size of perch shown. Because of its natural growth, your perch(es) will differ somewhat from these examples.